What is "Hands For Heroes" about? It's about honouring our courageous Servicemen and women, both serving and retired, by providing valuable, practical, hands-on care to relieve physical, emotional and chemical stress and trauma. "Its good for the spirit to know that whilst Governments make many promises about helping and at best take years to deliver - in a few short weeks I have made a real and lasting difference serving those who have given military service and more, on my behalf". A Hands For Heroes Volunteer. 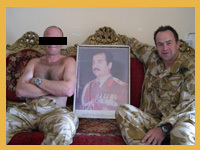 "To provide 9000 UK veterans from Afghanistan and Iraq operations access to £3.5 Million of free Chiropractic Care by the end of 2011 and every year there-after for the next 2 decades in order to relieve the destructive effects of physical, mental and chemical stress and trauma." If you are a UK or International chiropractor looking to support the "Hands For Heroes" movement then click here. If you are a Gulf, Iraq or Afghanistan veteran looking to improve your performance and health at home and at work with free chiropractic care then click here. If you are a member of the public who would like to support this initiative then click here to find out how you can help. "Without my understanding of chiropractic care and how it has worked to improve my nerve system function I sincerley believe I would not be here today. That would have been a huge tradegy for me, for my wife, for my children and for my family and friends. Why a Twenty Year Mission? That many service men and women are returning physically crippled by their traumatic service is clear – what will not be clear for many years is the huge mental cost which is currently being paid. 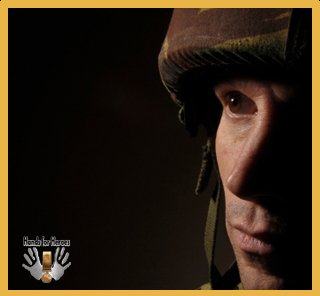 The Combat Stress charity reports that it takes 14 years on average for veterans to seek help with mental health issues. 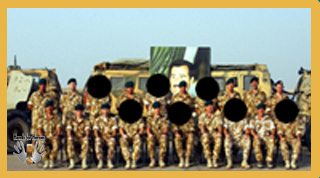 In July 2009 The Independent newspaper reported that, ”Twenty-four British soldiers died during the 1991 Gulf War, but the Ministry of Defence disclosed last year (2008) that 169 veterans of the conflict had died from "intentional self-harm" or in circumstances that led to open verdicts at inquests”. In other words, over 7 times more people are suspected to have killed themselves in the aftermath of the first Gulf War, because of mental health breakdowns, than died from the physical effects of the war itself. As the time taken for these major health problems to unfold can be measured in decades this is the reason we have a twenty year mission. The Team at "Hands For Heroes". Westminster chiropractor or Western US chiropractor join Hands for Heroes here. Whether you are a Westminster Chiropractor or Western US chiropractor join here if you want to make a huge difference to the lives of Iraq and Afghanistan veterans. Frequently asked Hands for Heroes questions answered here. "Heroes News" the electronic magazine of the movement "Hands For Heroes"
Welcome to "Heroes News" the electronic magazine of the movement "Hands For Heroes - Free Chiropractic Care for War Veterans"
The Blog of "Hands For Heroes - Free Chiropractic Care for War Veterans". Chiropractors giving support and resources for veterans to maintain and improve their health and wellbeing. Hands For Heroes Chiropractor Resources. To access this info you must be a Hands for Heroes signed up chiropractor. Welcome to the Hands for Heroes products and free downloads page. 3.5M pounds worth of Chiropractic Care his been donated. You can contribute too by buying products here. Contact hands for heroes here. Chiropractor in Hamilton providing Free Chiropractic care to war veterans Dr Greg Venning the Chiropractic Doctor of Glasgow Chiropractic - Hamilton details are here. Chiropractor in Mansfield providing Free Chiropractic care to war veterans Dr William Olar the Chiropractic Doctor of Olar Family Chiropractic details are here. Chiropractor in Mytchett providing Free Chiropractic care to war veterans Dr Rob Scott the Chiropractic Doctor of Farnborough Chiropractic Clinic details are here. Chiropractor in Dartford providing Free Chiropractic care to war veterans Dr Charles McMaster the Chiropractic Doctor of Cressingham Chiropractic details are here. Chiropractor in Phoenixville providing Free Chiropractic care to war veterans Dr Phoenixville Schaffer the Chiropractic Doctor of Kimberton Chiropractic details are here. Chiropractor in Pittsburgh providing Free Chiropractic care to war veterans Dr Randy Tabita the Chiropractic Doctor of Newman Chiropractic Center O’Hara details are here. Chiropractor in Bricket Wood St Albans Hertfordshire providing Free Chiropractic care to war veterans Dr Alexander Smith the Chiropractic Doctor of Bricketwood Chiropractic details are here. Chiropractor in Haywards Heath providing Free Chiropractic care to war veterans Dr Steve Minter the Chiropractic Doctor of Sussex Chiropractic details are here. Chiropractor in South Gyle, Edinburgh providing Free Chiropractic care to war veterans Dr Gary Blackwood the Chiropractic Doctor of White Tree Chiropractic details are here. Chiropractor in Beaver providing Free Chiropractic care to war veterans Dr Michael Trautman the Chiropractic Doctor of Newman Chiropractic Center details are here. Chiropractor in Berkhamsted providing Free Chiropractic care to war veterans Dr Lauren Comley the Chiropractic Doctor of Berkhamsted Chiropractic & Health Care Clinic details are here. Chiropractor in Haddington providing Free Chiropractic care to war veterans Dr Gary Blackwood the Chiropractic Doctor of Wight Chiropractic details are here. Chiropractor in Ithaca providing Free Chiropractic care to war veterans Dr Brian Bartholomew the Chiropractic Doctor of Bartholomew Family Chiropractic details are here. Chiropractor in Torquay providing Free Chiropractic care to war veterans Dr Dipty Patel the Chiropractic Doctor of Essential chiropractic details are here. Chiropractor in Halifax providing Free Chiropractic care to war veterans Dr Simon Gough the Chiropractic Doctor of Calder House Chiropractic Care details are here. Chiropractor in Bracknell providing Free Chiropractic care to war veterans Dr Damien O’Dwyer the Chiropractic Doctor of Bracknell Chiropractic Clinic details are here. Chiropractor in Saltash providing Free Chiropractic care to war veterans Dr Jon Clarke the Chiropractic Doctor of Saltash Chiropractic Clinic details are here. Chiropractor in Ayr providing Free Chiropractic care to war veterans Dr Ryan Bonney the Chiropractic Doctor of Ayr Spinal Centre details are here. Chiropractor in Treorchy providing Free Chiropractic care to war veterans Dr John Roberts the Chiropractic Doctor of Rhondda Chiropractic Clinic details are here. Chiropractor in Kingston providing Free Chiropractic care to war veterans Dr Daniel Rainbow the Chiropractic Doctor of Back to Health details are here. Chiropractor in Glasgow providing Free Chiropractic care to war veterans Dr Matthew Doyle the Chiropractic Doctor of Glasgow Chiropractic - St Vincent Place details are here. Chiropractor in Kilmarnock providing Free Chiropractic care to war veterans Dr Robert the Chiropractic Doctor of Kilmarnock Chiropractic details are here. Chiropractor in South Sheilds providing Free Chiropractic care to war veterans Dr Luc Presseau the Chiropractic Doctor of South Shields Chiropractic details are here. Chiropractor in Dorchester providing Free Chiropractic care to war veterans Dr Richard Southam the Chiropractic Doctor of Aquae Sulis Chiropractic details are here. Chiropractor in Maldon providing Free Chiropractic care to war veterans Dr Charles the Chiropractic Doctor of The Spinal Health Centre - Maldon details are here. Chiropractor in Cobham providing Free Chiropractic care to war veterans Dr Colliver the Chiropractic Doctor of Cobham Chiropractic Centre details are here. Chiropractor in Edinburgh providing Free Chiropractic care to war veterans Dr Ross McDonald the Chiropractic Doctor of Discover Chiropractic details are here. Chiropractor in Tynemouth providing Free Chiropractic care to war veterans Dr Estelle the Chiropractic Doctor of Naturally Chiropractic details are here. Chiropractor in Kenilworth providing Free Chiropractic care to war veterans Dr Peter the Chiropractic Doctor of Kenilworth Chiropractic Clinic details are here. Chiropractor in Bristol providing Free Chiropractic care to war veterans Dr Bronwen Henley the Chiropractic Doctor of Bristol Chiropractic Clinic details are here. Chiropractor in Edinburgh providing Free Chiropractic care to war veterans Dr Jonathan Liu the Chiropractic Doctor of Liu Chiropractic details are here. Chiropractor in Bideford providing Free Chiropractic care to war veterans Dr Jean Tallantire the Chiropractic Doctor of Bideford Chiropractic details are here. Chiropractor in Reading providing Free Chiropractic care to war veterans Dr Kelly-Jane Thompson the Chiropractic Doctor of Dynamic Family Chiropractic details are here. Chiropractor in Longmont providing Free Chiropractic care to war veterans Dr Jay Breitlow the Chiropractic Doctor of New Leaf Chiropractic details are here. Chiropractor in Kilgetty providing Free Chiropractic care to war veterans Dr Tony Morgan the Chiropractic Doctor of St Francis Clinic details are here. Chiropractor in Billinghurst providing Free Chiropractic care to war veterans Dr Patricia Carlton the Chiropractic Doctor of Carlton Chiropractic details are here. Chiropractor in Geneva providing Free Chiropractic care to war veterans Dr Emmanuele Graton the Chiropractic Doctor of McTimoney Cabinet details are here. Chiropractor in Bloxham providing Free Chiropractic care to war veterans Dr Elizabeth Hearle the Chiropractic Doctor of Bloxham Chiropractic details are here. Chiropractor in Colchester providing Free Chiropractic care to war veterans Dr Susan Godwin the Chiropractic Doctor of Bodyworks Chiropractic Clinic Ltd details are here. Chiropractor in Derby providing Free Chiropractic care to war veterans Dr Stuart Rudd the Chiropractic Doctor of Derby Family Chiropractic details are here. Chiropractor in Guildford providing Free Chiropractic care to war veterans Ian Miller the Chiropractic of Ian Miller Chiropractic details are here. Chiropractor in Epping providing Free Chiropractic care to war veterans Dr Patrick the Chiropractic Doctor of Chiro4Health details are here. Chiropractor in Oldham providing Free Chiropractic care to war veterans Dr Morten Isnes the Chiropractic Doctor of Oldham Chiropractic Clinic details are here. Chiropractor in Wichen Ely providing Free Chiropractic care to war veterans Dr Beverley Wing the Chiropractic Doctor of Woodwalton Chiropractic details are here. Chiropractor in Fairford providing Free Chiropractic care to war veterans Dr Adrian Griffiths the Chiropractic Doctor of Fairford Chiropractic details are here. Chiropractor in Tonbridge providing Free Chiropractic care to war veterans Dr Susan Court the Chiropractic Doctor of Susan J Court Ltd details are here. Chiropractor in Rugby providing Free Chiropractic care to war veterans Dr Peter Sawyer the Chiropractic Doctor of Clifton Road Chiropractic details are here. Chiropractor in Wimborne providing Free Chiropractic care to war veterans Dr Amritam Mills details are here. Chiropractor in Cardiff providing Free Chiropractic care to war veterans Dr Andrew Miles the Chiropractic Doctor of Llandaff Chiropractic Clinic details are here. Chiropractor in Bristol providing Free Chiropractic care to war veterans Dr Ben Quinton the Chiropractic Doctor of Cotham Chiropractic Clinic details are here. Chiropractor in Matlock providing Free Chiropractic care to war veterans Dr Priscilla So the Chiropractic Doctor of So-Healthy details are here. Chiropractor in Ashton under Lyne providing Free Chiropractic care to war veterans Dr Anne Reinkin the Chiropractic Doctor of Ashton Chiropractic Family Wellness Centre details are here. Chiropractor in Stafford providing Free Chiropractic care to war veterans Dr Gemma Collins the Chiropractic Doctor of Gemma Collins Chiropractic details are here. Chiropractor in Lechlade providing Free Chiropractic care to war veterans Dr Matthew Eatwell the Chiropractic Doctor of Lechlade Chiropractic Clinic details are here. Chiropractor in Sowerby bridge providing Free Chiropractic care to war veterans Dr Simon Gough the Chiropractic Doctor of Calderdale Chiropractic details are here. Chiropractor in Ipswich providing Free Chiropractic care to war veterans Dr Amit Patel the Chiropractic Doctor of Ipswich Spine Clinic details are here. Chiropractor in Oxford providing Free Chiropractic care to war veterans Dr Hilary Royall the Chiropractic Doctor of Hinksey Chiropractic Clinic details are here.